Cloud Masters Program makes you proficient in designing, planning, and scaling cloud implementation. 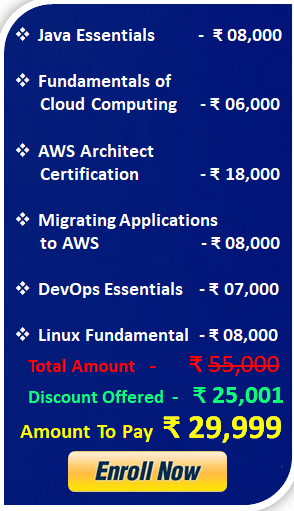 It includes training on Java, Cloud Computing, AWS Architectural Principles, Linux, and DevOps.You’ll learn to master the architectural principles and services of two of the top cloud platforms, design and deploy highly scalable, fault-tolerant applications and develop skills to transform yourself into a cloud architect. Our CLoud Masters Learning Paths provide a guided learning experience for all cloud certifications. Learn how to master, manage and architect all cloud features and services using video courses, dedicated quizzes, and hands-on labs. This Linux course will cover the entire red hat certification contents and this will cover more practical sessions rather than theory. Since we have separate troubleshoot sessions as part of this course will make you good expertise in Linux® administration. This troubleshooting session will make your life easier when working at an office. The median salary for IT professionals with cloud computing experience is $90,950. Currently, there are 18,239,258 cloud computing jobs worldwide. There is an explosion in both cloud computing use and demand for people who can help with cloud migrations. Public cloud services are breaking down into three broad categories: software-as-a-service, infrastructure-as-a-service, and platform-as-a-service. SaaS is well known and consists of software applications delivered over the Web. Infrastructure-as-a-service refers to the remotely accessible server and storage capacity, while platform-as-a-service is a compute-and-software platform that lets developers build and deploy Web applications on a hosted infrastructure. You don’t need to do anything on our website; you just need a username and password to activate your Public Cloud servers right away. You will be billed at a later date for your usage. Just like an instance or a container, buying cloud credit generates an invoice. Once your project has been credited, all invoices associated to it will be collected on a priority basis using the available cloud credit. In addition to being a pioneer in cloud-based sales force automation, Salesforce is the recognized leader in CRM customer engagement. With Service Cloud, you can automate service processes, streamline workflows, and surface key articles, topics, and experts to transform the agent experience. Connecting one-to-one with every customer, across multiple channels, and on any device, was never easier. A self-service community is a customer portal that allows you to help customers help themselves. Delivering self-service means showcasing your knowledge base and offering case management to customers, so they can get answers to their questions anytime, on any device, from community content or peers. This allows your agents to focus on solving the most complex issues. And you can even create an internal self-service community for your employees to collaborate on content and business processes.